The Josie Maran Pure & Simple 4 Piece Argan Skincare Ritual QVC Today’s Special Value launches tomorrow on the Q. This is an exceptional value particularly if you’re a fan of Josie’s products as you’re getting four full size products for a great price. Wanna win one of two Josie Maran Pure & Simple Argan Skincare Ritual Sets? I have two I’m giving away! The giveaway ends in 12 hours so click here to enter if you haven’t already. Unfortunately I’m under an embargo and can’t release as many details as I’d like about this set. QVC Insiders you already have the details I’m sure however, if you aren’t a QVC Insider that’s ok. Just head to QVC.com sometime tomorrow and you can place an order for this great set. I can say it’ll be under sixty dollars and it’ll be available on auto delivery with two more shipments of the same products arriving at your door step in December and April. All the products remain the same except for the Argan Color Stick, this one will be a new shade with each shipment you receive. Of course, you can also indulge in the set as a one time shipment. I’m already a fan of Josie’s Argan Oil and use it nightly as part of my Winter skincare regime. This is a thick oil which absorbs easily into the skin and can be used in any number of ways. On your skin, in your hair, etc…anywhere you need extra hydration. 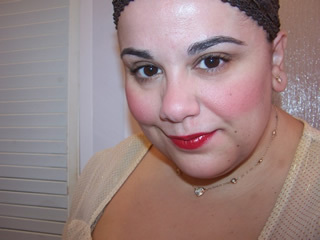 Of course, I’ve always made my love of Josie’s Argan Color Sticks known numerous times on Musings. The shade you get is Beautiful which is a rosy color that has a certain mauve-yness to it. It’s a lovely your blushing cheeks but better look. The stick can be used on face and lips and has a soft, hydrating texture. The two products I haven’t tried were the Cleansing Oil and Tinted Lotion. Josie Maran Argan Daily Moisturizer Protect + Perfect Broad Spectrum SPF 40 Tinted Lotion is a paler shade so it won’t be suitable for all skin types. But fair to medium can easily get away this this. It’s a sheerer shade of color that evens out skin tone with a lovely hydrating texture. I must say this might just be a new favorite tinted moisturizer for me. I was a little worried this would be too oily or greasy since it is infused with Argan Oil. But the texture is beautiful. It isn’t too thin nor is it too thick and it absorbs easily into my skin and leaves behind just the right amount of moisture. The shade looked too light for me but it actually works just fine to enhance the tone of my own skin and just create a more flawless finish. It’s chemical free and has a whooping SPF 40. 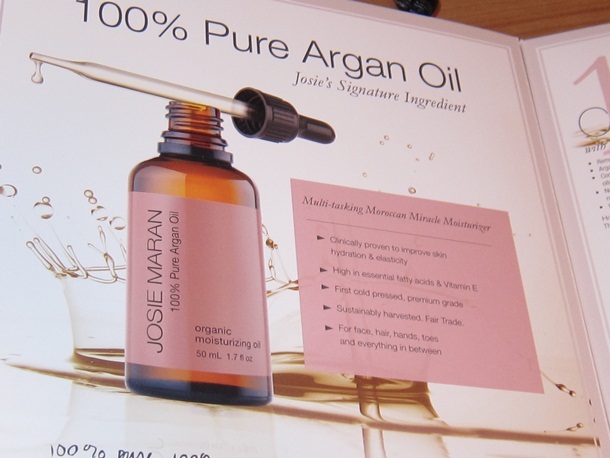 Josie Maran Argan Cleansing Oil is a little different from other cleansing oils I tried. This runs thicker and a bit on the drier side, sounds weird I know. You wouldn’t expect cleansing oil to be dry but this does have an odd texture that isn’t entirely runny or oily. But no matter, it works great. It has a lemon-y scent kinda like the scent Argan Oil carries. It removes makeup easily even waterproof mascara. It emulsifies fairly quickly as well so it rinses clean away without leaving skin feeling dry or tight. When I first saw this set in my QVC Insider Magazine I actually skipped over it. I wasn’t interested in more Argan Oil since a single bottle lasts me ages. But I’m delighted I got a chance to try the set as it really changed my mind. I’d have never discovered the Tinted Lotion if I didn’t get this kit and I’ve been meaning to try Josie’s Cleansing Oil so that was an added bonus! This is a great value overall. I’m going to go ahead and Muse Approve it. Four fabulously full size products at this price can’t be beat. Believe me buying them separately would cost you way more. Every try the Tinted Lotion? I have never tried Jose Maran I will have to give it a try now! I like to use Josie’s products. OMG – I am so getting this…. I’m nearly out of any sort of cleansing oil, and I was gonna get the JM one and now I can get a whole crapload of goodies for not much more than the cost of the cleansing oil alone!! Thanks for the review Muse!! The color stick looks like a really nice deep shade, the shimmer looks super beautiful in your pic, and I love her cleansing oil, it has such a pretty light fragrance. I just saw a new display at Sephora with the steps and products of her regiment and am so excited about this kit! Thank you for the review. Muse, do you know the shades of the sticks in the future A-Ds? hey linda! It’s really a pretty shade ;-D my pleasure! Did you order it? I do not unfortunately 🙁 I wish I did but the info I got was super limited blah! I totally caved. I watched online and Lisa was presenting, she always manages to convince me to order whatever cosmetic tsv they have, and I already loved Josie’s cosmetics so yea had to! This is my go to cleanser. It seriously changed my skin, been using it for just under a year. My acne has improved dramatically!!! I’ve heard so much about Josie’s Argan Oil, that I feel I might need to joint the cool crowd and get me some of this miracle stuff. I like your stamp of approval! Looks good but I think I can pass. I love DHC Cleansing Oil and just bought a new batch. I haven’t tried the Argan Oil yet but I have a sample from one of the test tubes. If I needed the products this looks like a nice set to try. I tried a sample of JM Argan Oil several years ago then again recently. It’s a good thing I didn’t buy it full size, though I loved it, but I’m severely allergic to argan oil 🙁 Had horrible hives everywhere within minutes. So sad, it was great on my skin while it lasted. I had to toss out a mostly full bottle of argan oil I bought from because I didn’t have anyone to give it to. Like you Ive felt compelled to try it all in search of a good skincare and beauty routine for my dry sensitive dry skin. Search no more! Josie Maran with afew Dr Perricone antiagers are now mygo tos. My skin has never looked better! I wanted to get this to try the new Tinted moisturizer but I’ve read some reviews that its dark on fairer skin tones. I tried the Josie Maran Match Maker in Fair/Light and even that was a little yellow for me. Do you think I could get away with this without it looking unnatural. I usually only wear tinted moisturizer and blush.